Can you believe it is already March? Not only is 2016 quickly passing us by, but March has many fun holidays, including St Patrick’s Day, Easter, and one of our new favorites – National Sloppy Joe Day. Never heard of this little known holiday? Well, on March 18th, you will be able to enjoy this awesome sandwich with fellow fans across the nation. 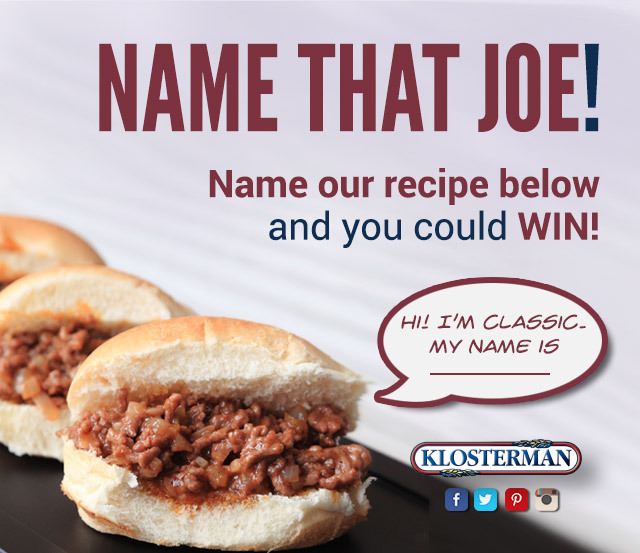 To celebrate this holiday, Klosterman Bread is having their own fun little contest called “Name that Joe.” By naming one of their sandwiches, you have a chance of winning a year of free Klosterman’s bread! As well, for each post shared on Facebook and retweet on Twitter, one loaf of Klosterman Bread will be donated to Cincinnati’s Freestore Foodbank. Bonus! By playing, you’ll be entered to win free Klosterman Whole Grain Rich Slammer Buns for a year. Get ready to “Name That Joe”! To learn more and how you can enter, head over to the Klosterman bread page! Great hadn’t heard of this. I posted it on a group fb & we are going to have our own contest LOL. I just have to think of a prize for a bunch of WoW gamers!